LIENZ, Austria — Federica Brignone gave Italy its first women’s World Cup win of the season on Friday, one day after Dominik Paris got the Italian men’s team its first podium by winning the Bormio downhill. 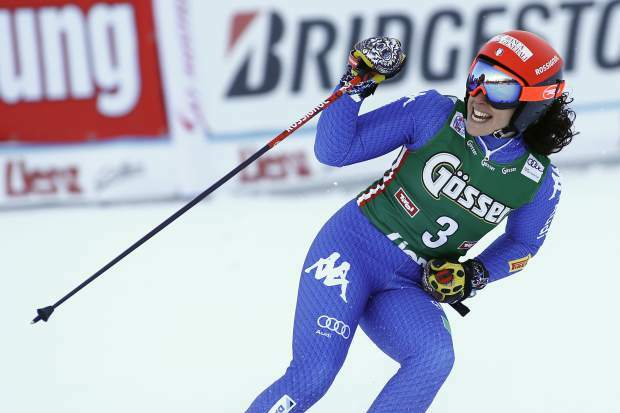 Ranked fourth after the opening leg of a giant slalom on the Schlossberg course, Brignone posted the fourth-fastest time and edged first-run leader Viktoria Rebensburg of Germany by 0.04 seconds. “I am so happy with first place,” said Brignone, who has been dealing with adductor problems. She returned early from a preseason training camp in South America and sat out the start of the World Cup season. This was her sixth career win, and fourth in GS. Overall champion Mikaela Shiffrin of the United States was 0.08 behind in third, and French world champion Tessa Worley trailed by 0.26 in fourth. Former overall champions Lara Gut of Switzerland and Anna Veith of Austria, who both returned from knee injuries this season, finished 10th and 21st, respectively. Brignone said her injury was still hampering her. Chasing her first win on Austrian snow since taking the season-opener in Soelden two years ago, Brignone said she “didn’t feel so good at the start” of her first run, which she finished 0.17 off Rebensburg’s leading time. “The slope is very tough and it was a little bit bumpy but I knew I had to charge all the way down,” she said about her winning second run. Brignone denied Rebensburg a third win of the season after the German took the first two giant slaloms in Soelden and Killington. Rebensburg has earned 13 of her 15 career World Cup wins in GS. Defending her slim lead from the opening run, the 2010 Olympic champion lost just too much time as she wasn’t clean in the steep middle section of the course. Rebensburg overtook Shiffrin atop the discipline standings. After four races, the German has 298 points, 13 clear of the American. However, Shiffrin will enter 2018 as the clear overall World Cup leader with 881 points, 371 ahead of the German. A day after dominating the slalom on the same course, Shiffrin was 0.05 behind Rebensburg in second after the opening run and lost a place after posting the eighth-fastest time in the final run. “I like to be one who is chasing. I didn’t have a lead to work with so I felt like I really had to go and give everything in the second run,” said Shiffrin, who won the previous GS in Courchevel 10 days ago. The next World Cup is a city event in Oslo on Monday.